Harnessing energy from low-cost and highly efficient fuel cells to power mobile devices and commercial transportation will provide a critical source of clean energy and reduce the global carbon footprint. Brad Easton, PhD, Professor of Chemistry in the Faculty of Science, leads the University of Ontario Institute of Technology's Electrochemical Materials Lab where his research group prepares and characterizes new materials with primary applications in electrochemical systems. A materials electrochemist, he develops new materials and compounds that display notable electrochemical properties and tests them for energy conversion and storage applications, such as fuel cells or capacitors, or for electrochemical sensing, which determines the presence and concentration of certain compounds. His latest research focuses on the study and enhancement of sulfonated silica-based ceramic carbon electrodes (SS-CCE), a new, low-cost fuel cell electrode technology which performs extremely well in dry conditions, compared to conventional fuel cell materials. His novel approach will lead to the development of higher-performing and lower-cost fuel cells, enabling Canada to meet its clean energy needs. Driven by the science of discovery, Dr. Easton's research group has developed real-world and real-time diagnostic measurements to better understand how electrode materials are breaking down, while avoiding subsequent expensive and difficult measurements. A key area of his research examines new fuel cell electrode structures. Within these structures, a polymer is used to provide ionic conductivity and also serves as an electrode binder. However, the current polymer does not operate effectively under all environmental conditions. Dr. Easton has developed a low-cost material that can be operated under dry conditions and have essentially zero loss in performance. His research also investigates ways to improve the stability of fuel cells in mobile power systems which typically perform optimally when first used; however, cell performance degrades over time. 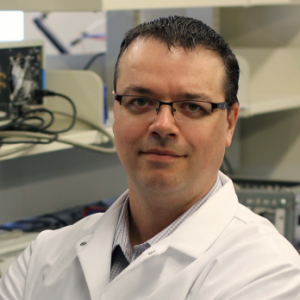 Dr. Easton earned his Bachelor of Science and his Doctorate in Chemistry from Memorial University of Newfoundland. He joined the University of Ontario Institute of Technology as an Assistant Professor in 2006, following the completion of two NSERC post-doctoral fellowships at Simon Fraser University in Burnaby, British Columbia, and at Dalhousie University in Halifax, Nova Scotia. This Early Stage Researcher Award recognizes excellence in research achieved by faculty members whose research over the past 10 years since obtaining doctoral degree(s) is judged as outstanding by the selection committee. This invention relates to an oxygen-reducing catalyst layer that includes a thermally stable substrate and a catalytic material film disposed on the thermally stable substrate. The catalytic material film includes carbon, nitrogen, and a transition metal selected from the group consisting of iron, cobalt, and combinations thereof. The oxygen-reducing catalyst layer exhibits good catalytic activity and is corrosion resistant. Sulfonated silane ionomeric materials useful in electrodes of e.g., membrane electrode assemblies (MEA) of fuel cells can improve cell performance. MEAs prepared with CCE cathode catalyst layers and standard ELAT anode layers over a period of several start-stop cycles, as well as at multiple relative humidities were studied. The MEA performance was monitored using cyclic voltammetry, electrochemical impedance spectroscopy, and fuel cell polarization curves. The CCE cathode materials appeared to maintain performance and had improved water management capabilities at comparatively low relative humidities. Principal investigator of this major three-year research program, Dr. Easton is focused on the study and enhancement of sulfonated silica-based ceramic carbon electrodes (SS-CCE), a new and innovative fuel cell electrode technology. The long-term objective of this strategic grant is aimed at understanding the phenomena that enable these SS-CCEs to perform well under dry conditions, and to further improve the material's performance. This research is supported in-kind by Ballard Power Systems in Burnaby, British Columbia. As principal investigator of this five-year research program, Dr. Easton is focused on fundamental studies of advanced materials targeted for electrochemical energy systems including fuel cells, electrolyzers and electrochemical/super capacitators which have the potential to be more widely deployed in the energy landscape. He recently developed an EIS-based diagnostic methods that can clearly explain the mode of electrode degradation occurring. This program will also concentrate on the refinement of electrochemical impedance spectroscopy (EIS) measurements as a go-to diagnostic tool by understanding how the electrode surface is changing over time and also to quantify active surface species, both metallic and carbon-based, and how this impacts activity. Dr. Easton is a co-investigator on this five-year research project to provide a detailed characterization of the fundamental properties MEA materials under conditions relevant to CuCl electrolysis, ultimately leading to higher cell performance and increased durability. This involves the identification, synthesis and evaluation of new materials as well as the development of experimental techniques by which these can be characterized. As principal investigator on this five-year research program, Dr. Easton is focused on fundamental studies of novel materials for electrochemical energy systems. The materials include inorganic-organic hybrid materials based on siloxane copolymers formed through sol-gel chemistry as well as surface functionalized carbon materials. Such materials have potential applications in polymer electrolyte membrane fuel cells and biosensors. This research seeks to design materials with enhanced properties and providing new insights into the factors that impact structure and performance. Key parameters of interest include conductivity, electrochemically active surface area, catalytic activity and performance. As principal investigator on this three-year research project, Dr. Easton is focused on developing faster, more reliable and lower cost fuel cell-based sensors for ethanol detection, a critical technology used to detect impaired driving. This collaborative research endeavour aims to create next generation materials for fuel cell-based ethanol sensors, for example, new electrodes that employ lower platinum loadings as well as platinum alloys. Similarly, more durable membrane materials, such as those targeted for high-temperature fuel cell applications which have been developed in Dr. Easton's lab are also being investigated. In addition to enhancing the fundamental understanding of this sensory system, the research findings are expected to have important economic and industrial consequence, and lead to increased road safety in Canada. A state-of-the-art fuel cell-based breath alcohol sensor (BrAS) testing station was developed and used to test electrocatalysts typically employed in power generating fuel cells for ethanol sensing. The design of this test cell and station enabled in situ monitoring of membrane electrode assemblies (MEA) health through cyclic voltammetry (CV) and electrochemical impedance spectroscopy (EIS) measurements in an operating sensor. The oxidative treatment of carbon used to increase surface wetness can also make it less stable and more prone to carbon corrosion at high potentials when used in a fuel cell cathode. In this work, we investigate an alternative non-oxidative approach in which a thin film of TiO2 nanoparticles (∼10–20 nm) is deposited on pristine carbon using a sol–gel method and glucose as carbon modifier to improve both wetness and dispersal of Pt on the support. Recent advances are reported by an international team on research and development of the copper chlorine (Cu–Cl) cycle for thermochemical hydrogen production. New experimental and numerical results are given for several processes of the cycle. Experimental results for CuCl/HCl electrolysis and integration of unit operations in the Cu–Cl cycle are presented. A new solubility model for the CuCl–CuCl2–HCl–H2O quaternary system is presented, which optimizes the cupric chloride selective precipitation prior to the hydrolysis reactor. Also, recent progress on photo-electrochemical cell development for enhancement of the electrolysis process is reported along with its integration with a concentrated solar radiation system. Decreasing the cost associated with platinum based catalysts along with improving catalytic properties is a major challenge for commercial direct alcohol fuel cells (DAFC). In this work, Pt/C and Pt–Mn/C alloys have been synthesized and the impact of heat treatment on the structure and electrochemical properties of these catalysts was investigated. This study demonstrates a novel technique to impart increased water-uptake and proton conductivity to a PVC polymer without destroying the pre-existing membrane morphology. In this work, sodium citrate (SC) was used as an additive to control the particle size and dispersion of Pt-Mn alloy nanoparticles deposited on a carbon support. SC was chosen, since it was the only additive tested that did not prevent Mn from co-depositing with Pt. Ceramic carbon electrodes (CCEs) have demonstrated their ability to function as proton exchange membrane fuel cell electrodes under low relative humidity (RH) conditions. Small quantities of sulfonated silane in the catalyst layer produced electrodes with high surface area, porosity, and water retention which improved catalytic activity and proton conductivity. The purpose of this work was to investigate the mechanisms that facilitate enhanced performance of CCE electrodes under different RH conditions. Two TiO2–C composite materials were prepared through a conventional sol gel synthesis using Vulcan XC-72 carbon black. The carbon was initially functionalised to form acid treated Vulcan (ATV) prior to TiO2 deposition. In one composite, the ATV was further modified through glucose adsorption (G-ATV) in order to facilitate the growth of small and uniform TiO2 nanoparticles on the carbon surface. This paper highlights and discusses the recent advances in thermochemical hydrogen production with the copper–chlorine (Cu–Cl) cycle. Extended operation of HCl/CuCl electrolysis is achieved, and its performance assessment is conducted. Advances in the development of improved electrodes are presented for various electrode materials. Electrocatalyst materials, consisting of Pt or Pt–Ru supported on carbon with and without TiO2, are evaluated for their activity towards the methanol oxidation reaction (MOR) in 1.0 M H2SO4 at 25 °C in the presence and absence of visible light irradiation. Electrochemical studies showed that enhanced MOR activity is achieved upon irradiation with visible light for each catalyst, in both the presence and absence of TiO2. Irradiation leads to no improvement in activity towards the formic acid oxidation reaction (FAOR) indicating that irradiation aids in the removal of adsorbed intermediate species, such as CO, during MOR. While the presence of a TiO2 support does lead to an increase in activity upon irradiation, about 50 per cent of the improvements arise solely from the irradiation of the metal-containing electrocatalysts themselves. This research has derived a simple expression to relate faradaic pseudo-capacitance, CF, determined by electrochemical impedance spectroscopy to the electrochemically active surface area (ECSA) of Pt electrocatalysts. Binary catalysts containing Pt and Cu have been synthesized by two different methods. The first method consists of mixing Pt4+ and Cu2+ cations in presence of NaBH4 to form PtCu/C alloy catalyst. In the second method, Cu/C nanoparticles were first synthetized then treated with Pt+4 in presence of NaBH4 in an attempt to form core shells Cu covered by Pt, Pt(Cu)/C. Ceramic carbon electrodes (CCE) for PEM fuel cells have been prepared in a one-pot procedure from a mixture of tetra ethyl orthosilicate (TEOS) and 3-trihydroxysilyl-1-propanesulfonic acid (TPS) polymerized in the presence of a platinized carbon with concurrent spray deposition of the partially gelled ink onto a gas diffusion layer. The CCE showed fuel cell performance comparable to commercially available Nafion-based cathodes. This high activity is explained in terms of the high electrochemically active surface area resulting from the enhanced proton conductivity in the CCE. Nonprecious metal catalysts (NPMC) for the oxygen reduction reaction were prepared by surface modification of a carbon black with 5,6-diamino-1,10-phenanthroline through diazonium and benzimidazole coupling chemistry. Both methodologies covalently attach 1,10-phenanthroline to the surface.